Comments: In kangaroo fashion, excited Ord's kangaroo rats jump on both hind feet using their tail for balance. Their leaps may be 6 feet long and 2 feet high. They have a thick body, short neck, large head and a long tail with a fur tuft at the end. Ord's kangaroo rats forage at night. In dry seasons, they conserve metabolic water by absorbing it from their kidneys and bladder, thus surviving for months without drinking. Their burrows are dug at the base of shrubs, grass clumps or along sandy roadways. Litters of 2-5 young are born in May and September. Their lifespan in the wild is about one year. 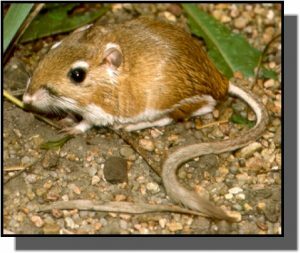 Distribution: Ord's kangaroo rats are found in sandy, semi-arid regions throughout central Mexico, the Great Plains and the western United States. They live in sandy prairies and overgrazed rangelands in the western half of Kansas. Food: Ord's kangaroo rats feed on seeds, grains, forbs, grasses, flowers, buds, tubers and insects.